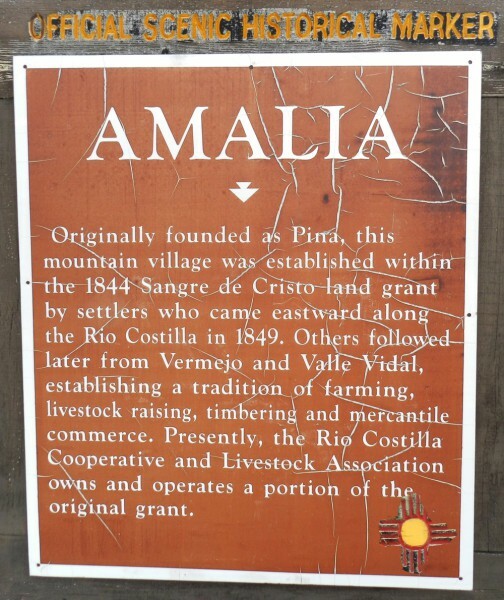 The community of Amalia is nestled along the banks of the Rio Costilla in northern Taos County, still in New Mexico but just a few miles south of the Colorado state line. The valley is not very wide, perhaps only a half mile at its widest part. There are mountains to the north and south. Situated at over 8,000 feet elevation the climate is glorious in the summer and fall. Never too hot, but just right during the day, with cool mountain evenings. Winter can be cold but that cold brings snow with ample opportunity to enjoy winter sports. Spring is iffy as in much of northern New Mexico. There can be beautiful days and then the next day there might be a spring snowstorm. Never fear, the snow will be gone the next day if not the same afternoon.